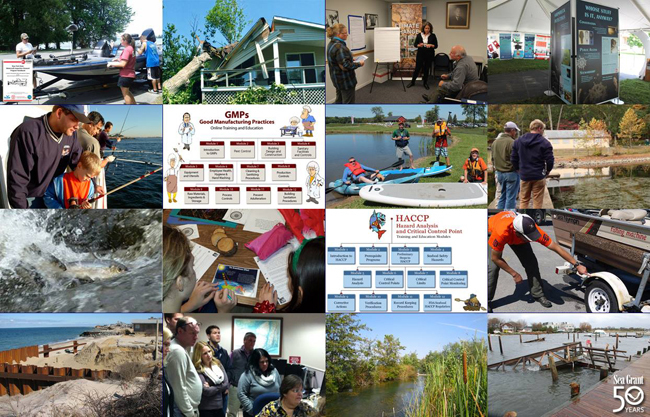 How are New York Sea Grant's extension specialists educating and informing stakeholders and coastal users in NY and beyond? And what impacts are our investigators reporting from their research projects? Learn more about the "success stories" of our Sea Grant extension specialists and funded researchers in New York's Great Lakes and marine waters. The coastal efforts of both groups serve Lakes Ontario and Erie, Long Island, Manhattan and the Hudson Valley. Extension activities are also documented in the "News/Topics" section of NYSG's individual resource Web sites. Additional Research stories can be found for several years here [2010 | 2009 (pdf) | 2008 (pdf) | 2007 (pdf) | 2006 (pdf)]. And a wider collection of research projects can be search for in our "Research Database."